My mom is an incredibly thoughtful gift giver. This year for Christmas, she gave me a painting that I have been wanting for a couple of years now. I am so excited to have this piece of artwork up in our home. 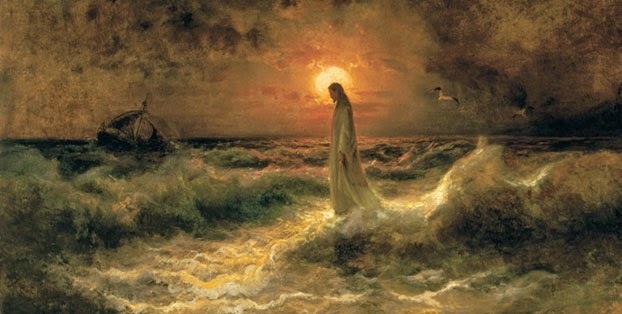 The painting is entitled Christ Walking on the Waters and is by Julius Sergius von Klever. When I first saw this piece, I couldn't stop staring. I've heard people talk about art "speaking to them" and that definitely happened with this painting and me. I love how this depiction of Christ that is layered with beauty and meaning. It's not a portrait of Him, He's not laughing or even smiling, and in fact, His face can not be seen with any real clarity. Instead of focusing on His physical appearance, this piece of work centers on one of the most amazing miracles Christ performed. The story, which is found in the book of Matthew, tells how following the miracle of the feeding of the five thousand, Jesus sent the disciples by boat to the other side of Lake Galilee while he remained behind, alone, to pray. Night came, the winds increased, and the boat the disciples were in was caught in the midst of a storm. During this storm and the total darkness that came with it, the disciples saw Jesus walking on the sea. Jeffrey R. Holland states that at this moment, "The Savior simply took the most direct approach to their boat, striding out across the waves to help them, walking on the water as surely as he had walked upon the land." I love how the miracle of walking upon the water was accomplished because the Savior wanted to get to his disciples as quickly as possible and walking is what is made sense to Him. The men in the boat were frightened and thought they were seeing a spirit comes toward them. Christ, knowing their fear, called out to them, "It is I; do not be afraid." Finally recognizing the Master that night, Peter exclaimed, “Lord, if it be thou, bid me come unto thee on the water” (Matt. 14:28). And Christ’s answer to him was as it always is to all of us: “Come,” he said. Instantly, as was his nature, Peter sprang over the vessel’s side and into the troubled waves. While his eyes were fixed upon the Lord, the wind could toss his hair and the spray could drench his robes, but all was well—he was coming to Christ. Only when his faith and his focus wavered, only when he removed his glance from the Master to see the furious waves and the black gulf beneath him, only then did he begin to sink. In fear he cried out, “Lord, save me” (Matt. 14:28–30). Jesus is the Christ, the Son of the living God. He wishes us to come unto him, to follow him, to be comforted by him. Then he wishes us to give comfort to others. However halting our steps are toward him—though they shouldn’t be halting at all—his steps are never halting toward us. May we have enough faith to accept the goodness of God and the mercy of his Only Begotten Son. May we come unto him and his gospel and be healed. And may we do more to heal others in the process. When the storms of life make this difficult, may we still follow his bidding to “come,” keeping our eye fixed on him forever and single to his glory. In doing so we too will walk triumphantly over the swelling waves of life’s difficulties and remain unterrified amid any rising winds of despair. These words are close to my heart because I can definitely relate to them. I am incredibly grateful that I have been able to overcome some of the bigger storms in my life and see that the Savior was there throughout my trials, waiting for me and coming towards me with nothing but love. Of course, we have our moments of unbelief, but the Lord is there to save us in the end. So, for all of those reasons, I am grateful to have this painting up in our home. It will be a constant reminder of the Savior's desire to lift us up.